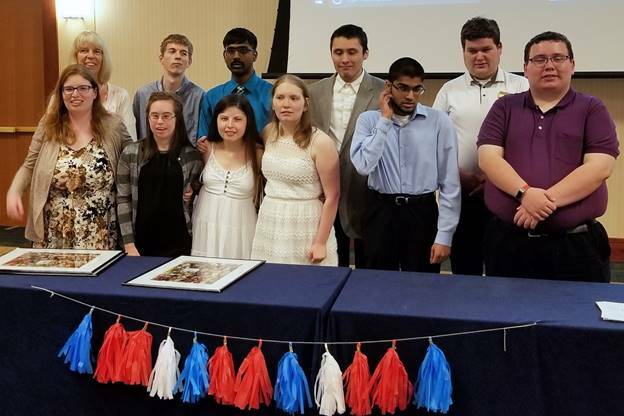 Job coach JoAnne Carroll, back row far left, joins Project SEARCH graduates Austin Ford, Mukivel Senthil Kumar, Zachary Lira, Ryan Thring, Cristina Bronson, Hannah Stellings, Emily FitzGerald, Baasil Ahmad and Aaron Fortune. The National Conference Center recently graduated its second class of Project SEARCH interns. The program, in partnership with Loudoun County Public Schools and Didlake, offers hands-on training for students with intellectual delays through workplace immersion. It includes long-term job coaching and continuous feedback from teachers and employers. The 10 interns placed at The National during the 2017-2018 academic year learned time management, social interaction, and a variety of stockroom, culinary and housekeeping skills. The National offered two of the 10 interns jobs in its guest dining and events departments. “This is an excellent program to help young adults transition from home and school to being in the real world,” stated Emily Meyers, Didlake employment specialist. Project SEARCH, which is funded by the Virginia Department for Aging and Rehabilitative Services, began in Virginia during the 2009-2010 academic school year. It’s since served more than 700 students.